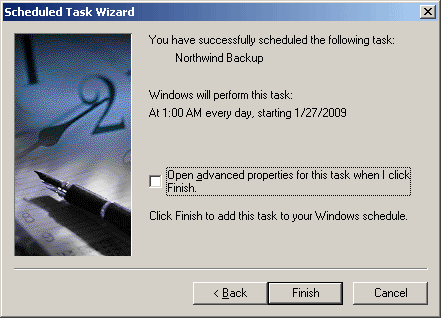 From the previous part, I have created a VB Script that perform backup database task on SQL Server. 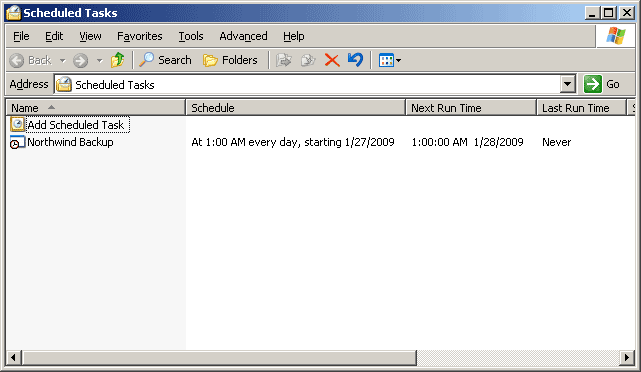 Next, create a task schedule to execute the script on the specific time as I want. I want the script to be executed every day at 1:00 AM. Open Scheduled Task. 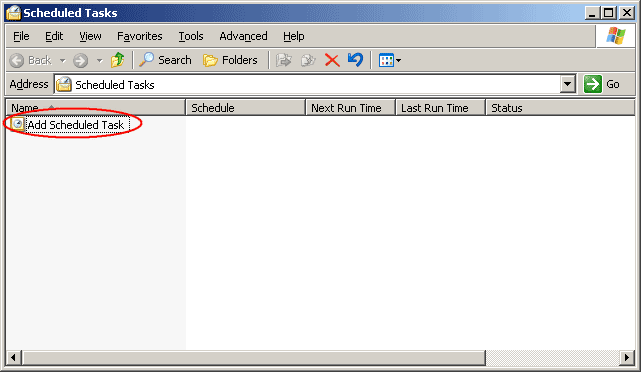 Start -> Programs -> Accessories -> System Tools -> Scheduled Task. Double-click on Add Scheduled Task to create a new task schedule. On Scheduled Task Wizard, click Next. On Select Program to Run, click Browse and select the VB script file. Define name of the task and select when to perform the task. In this example, I want to backup daily. Click Next. Select time to run this task. I set to 1:00 AM every day. Click Next. Enter the username and password. The task will be run by this user account. If you create a VB Script that using Windows Authentication mode, you have to enter the account that has backup privilege on the SQL Server. Click Finish to complete creating a task schedule. The task schedule has been created. Now when the time is 1:00 AM, the task will be run as the user account that you’ve spcified in the task schedule.